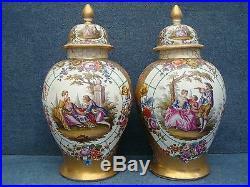 Porcelain-trader presents following object for sale. 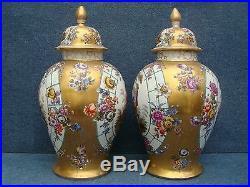 A large pair of late 19th century Dresden lidded vases with gold ground and Watteau panels/cartouches all sides. 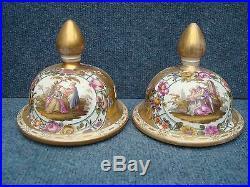 Each panel decorated with romantic pastoral hand painted scenes. The panels framed in a blue trellis work and floral bouquets. 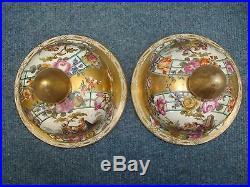 Even the lids have both sides panels decorated in the same manner. 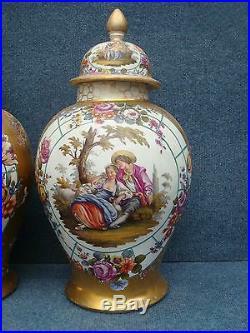 DRESDEN “in the Meissen style”. Blue crossed mark (bottom). German Porcelain, late 19th Century. H/W: 50/26 cm = 19,68/10,24 inches. Circonference: 84 cm = 33,07 inches (the body halfway). 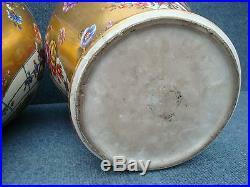 Diameter rim base: 18,5 cm = 7,28 inches. This pair of vases in very good condition, no chips, no cracks, no restoration ONLY the gold ground rubbed of cleaning over the years as photos show. Photos are part of the description. All items professionally packed. 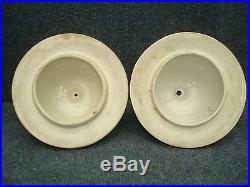 We only sell original antiques, no reproductions! 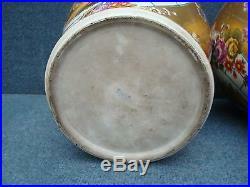 Used item, NOT new, non communicated age signs may occur, but description is done to best knowledge. More detailed photos by simple demand. 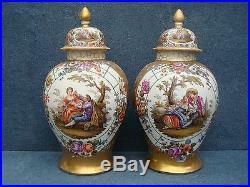 The item “Dresden Large pair of Vases Watteau reserves on gold ground Helena Wolfsohn” is in sale since Thursday, July 23, 2015. 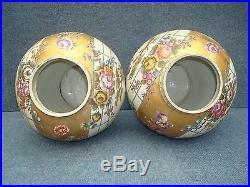 This item is in the category “Antiques\Decorative Arts\Ceramics & Porcelain\Vases”. 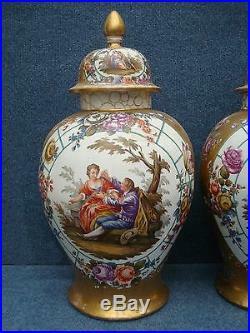 The seller is “porcelain-trader” and is located in LIMBURG. This item can be shipped worldwide.